Hairy Bulborbs (ケチャッピー?, lit. 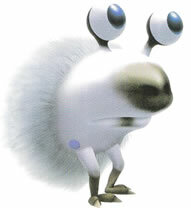 : "Fur Chappy") are enemies in Pikmin 2. They are similar in appearance to Red Bulborbs, but have white backs with blue spots and a lot of fluffy, white fur. As the creature's health begins to fall, so does its hair, revealing its blue spots, making it more closely resemble its Breadbug mimic, though larger in size. Hairy Bulborbs are similar in most respects to other mature Bulborbs, but tend to live in colder environments. They have less health and are slightly more aggressive than the Red Bulborb, but can be defeated using similar techniques. The Whiptongue Bulborb in Pikmin 3 is very similar in coloration. The Hairy Bulborb should be attacked while sleeping and approached carefully to delay it waking up as late as possible. If accidentally awakened, it can be made to fall back asleep by leaving it alone for a while. As with other mature Bulborbs, this creature's attacks are biting and shaking, biting the more harmful. As with most fights, Purple Pikmin are the most effective, and cause serious damage when thrown; the impact should stun the Bulborb, and it can be taken out quickly. Without purples, defeating one is trickier; rather than swarming it, try continuously tossing Pikmin, preferable reds, onto its back. If necessary, using an ultra-bitter spray to petrify the beast and swarming it with a fairly large army makes for an easy battle. Like all Bulborbs, the Hairy Bulborb can be killed by a leader, but it will take a while. One must be careful to dodge the creature's bite and, to a lesser extent, keep away when it shakes, as this damages leaders as well. The defining characteristic of this Bulborb is its hair, hence the name "hairy". Its Japanese name, ケチャッピー?, simply translates to "Fur Chappy", Chappy being the Japanese name for Bulborb. Its scientific name, Oculus kageyamii folliculus, shares the Oculus kageyammi species name from other grub-dogs, and folliculus is Latin for "follicle"; the hair follicle is the mammalian organ that produces hairs. Internally, this enemy is called yellowchappy. The reason for this is because initially, yellow and blue Bulborbs were meant to be included in the game. What started off as a yellow Bulborb eventually became the Hairy Bulborb. Louie and some Pikmin next to a Hairy Bulborb. The Hairy Bulborb chases Louie and some Purple Pikmin. A Hairy Bulborb in Challenge Mode. An awake Hairy Bulborb in the Piklopedia. A Hairy Bulborb, seen in an unused cave, challenge_2. A Hairy Bulborb in another unused cave, caveinfo_toy. The creature's e-card, #02 (2nd yellow card). In the Pikmin 2 prototype, Louie strangely seems to refer to the Hairy Bulborb as a bird, saying things such as to "pluck the feathers" instead of the hair, or mentioning that the foil should "protect the bird from scorching". It's possible that in the game's very early stages, the Hairy Bulborb was once a bird-related creature. The Japanese version of the Hairy Bulborb's recipe was drastically changed in the American version. Instead of the Bulborb being grilled in foil, it says to brew the hair into a drink which, according to the notes, increases blood circulation. This might refer to how the hair keeps the Bulborb's vital organs warm, as stated in Olimar's notes. Louie's notes say that one should pull out the hairs, though the creature's hair already falls off on its own when it dies. This page was last edited on February 13, 2019, at 21:44.